So why do we own a plane, exactly? We’re flying westbound along Interstate 40. Down below us, about 800 feet below our wings, semi-trucks, cars, jeeps, RVs, motorcycles and U-Hauls are… uh… passing us. It’s embarrassing. Finally I spy a 1972 Yugo. It has rusty doors, a duct tape and plastic back window, and the tail pipe is held on by a coat hangar. It chugs up the road belching exhaust, keeps pace with us for a little while, then pulls ahead, the driver oblivious to the small plane above him. This is beyond embarrassment. It’s totally humiliating. I mean, here we are, Knights of the Air, Aces of the Sky, and Masters of Speed—and we’ve just been passed by a Yugo. Riding a horse would be almost as fast. How can we go that slowly and not fall out of the sky? Because the sky moves independently from the ground. 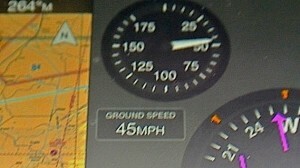 I may be flying 100 miles per hour through the air, but the air is flying 55 miles an hour in the opposite direction. It’s called a headwind, and it’s like paddling upstream or walking the wrong way on one of those concourse conveyor belts at the airport. I’m advancing towards my goal at the highly unproductive—and highly un-airplane-like—speed of 45 miles per hour over the ground, even though I’m moving through the air at more than twice that speed. 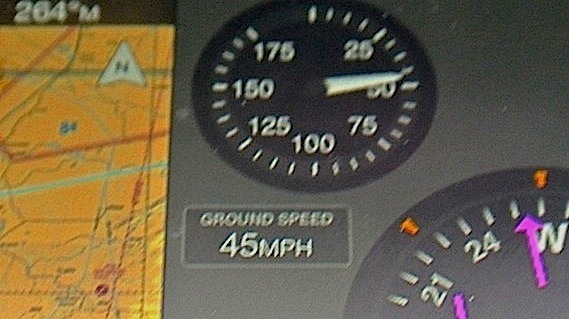 It’s the slowest ground speed I’ve personally experienced. I mean, don’t most states let you drive through school zones at 45 miles per hour? Heck, little ol’ lady Sunday drivers pass people who only drive 45 miles and hour (the flip them the bird as they do so). Of course, we got to where we were going, eventually. But it took a long time. A lot longer than planned, a lot longer than imagined, and slower than any other form of transportation available. The Yugo, the horse, and the little ol’ lady got there first. At least it was a good lesson for Rio on why a fuel reserve is not only mandated, but a damn good idea. Flying is always the best way to travel, but it’s not always the fastest way. People sometimes think that we are rich because we own an airplane. Nothing could be farther from the truth. Owning an airplane absolutely guarantees poverty. OK, I exaggerate. But unlike what you might expect, buying an airplane is not a terribly expensive undertaking. The Plane Tales Plane cost us quite a bit less than my Jeep Cherokee. Really, buying a plane is no big deal money-wise. Anyone with a job and a desire to own one can do it. The big costs come in when it actually comes to operating it once you’ve bought it, and those costs really pile up in some unexpected areas. It’s not the day-to-day operating, really. Fuel and oil sound pricy, with aviation gasoline usually around $6.50 a gallon, but Tessie’s old Continental only burns five gallons an hour, so an hour’s flight only costs thirty-two bucks. I’ll bet that’s lots cheaper than many other sorts of recreational activities. What’s the cost of a lift pass at a decent ski resort? Besides, where else can you have this much fun with your clothes on for only $32 per hour? Of course there are some little things that add to the cost. Hangar rent adds up, and don’t forget the insurance (which also, come to think of it, is still less than I pay State Farm for my Jeep). But it’s mechanical maintenance that’s the real cost of airplane ownership. It’s costly for any airplane, and even more expensive for an old airplane. Really, it’s the worst of owning an old house and restoring a classic car, with the added complication of being in bed with the Federal government. Since the summer of 2013, when we bought Tessie, we’ve contributed more to our mechanic’s childrens’ college funds than the damn plane cost in the first place! And this isn’t just a now-and-again thing. It’s an ongoing burden of sorts, because there are very few things that owners are allowed to do to an airplane, repair-wise. We can change oil and light bulbs. I think that’s about it. Oh and we can fix a flat tire. And to make matters worse on our bank account, we are required by Federal Law to pay our mechanics even when nothing needs fixing. Every year, every airplane in the country is required by federal law to have an “Annual Inspection,” often just called an Annual in the biz. The Annual on the Plane Tales Plane rings the cash register at $1,100. Just for the inspection. God forbid they find anything (and they will) it goes up from there. Annual inspections often become hugely more costly when major issues are found. Even minor problems easily double the cost. Of course, even an expensive repair is cheaper than a funeral, but you can see why plane owners spend a lot of time praying nothing is found when airplanes are in the shop. There’s always a certain sense of pocketbook dread when delivering your plane to its mechanic for the Annual. What’s this gonna cost me this year? All pilot owners have a love/hate relationship with their mechanics. We hate the fact they have us over a barrel, so to speak, but we’d hate it even more if something major happened in flight. I’d much rather pay $1,178 to have my mechanic replace some worn aileron rod ends (which I did at the end of July) than have the ailerons fail in flight. That would be bad. Now in all fairness, an Annual is a very complete inspection. They pull up the floor, go behind the instrument panel, peer into the wings, crawl into the tail, and basically just check every nut, cotter pin, and rivet on the plane. Beyond the look in every nook and cranny inspection, all airplanes have special required inspections based on their type. These are called Airworthiness Directives, or AD’s. These come down to us from the Feds and are often based on accident data. If some poor sod crashes because his wing spars rusted through and snapped off in flight, an AD might be created to make everyone who owns the same make and model of airplane check the plane for rust on the wing spar. Some AD’s are one-time checks. Others are “recurrent,” needing to be done every ten years, every five years, or every year. Older aircraft tend to have more ADs than newer aircraft, of course. Ercoupe 415-CDs have more than their fair share, with a total of 26 ADs. Many of them are time-consuming, and therefore expensive. So imagine my delight when Steve, my mechanic, called to report that the only thing that they found wrong during Tessie’s Annual was that the right wing-tip navigation light was burned out. Cost: $25 for the bulb, $22.50 for the fifteen minutes it took to change it. And that was it. I was quite pleased. The old girl had held together great for the last 12 months. Then the phone rang again. Steve had forgotten to mention that the Emergency Locator Transmitter battery had expired, so he ordered a new one. It would be forty bucks. OK, so now we have to talk a little about Emergency Locator Transmitters, called ELTs, which since the 1970s, are another federally required piece of gear for all U.S. Airplanes. ELTs are small radios that are designed to send a location signal on the emergency frequency of 121.5 MHz to help rescuers locate your plane if you crash. It sounds like a good idea on paper, but it doesn’t work out very well in the real world, because, as with many mandates, it all began with politics rather than technology. In the autumn of 1972, House majority leader Hale Boggs of Louisiana, Congressman Nick Begich of Alaska, and Begich’s aide Russ Brown disappeared on a flight from Anchorage to Juneau for a campaign appearance. Despite one of the longest searches in American history—39 days—no trace of the missing plane was ever found. Even to this day, the whereabouts of the (presumed) crash is unknown. The more important you are, the longer they look, you understand. If I disappear in the Plane Tales Plane I have no expectation of a search lasting for more than a few days. Anyway, Congress, having lost two of their own, moved quickly to solve the problem and made ELT’s mandatory. While this sounds sensible in theory, there were problems with the technology. Hard landings tended to set them off. Crashes tended to not set them off. And once activated, the signals tended to bounce around. They were hard to trace. In short, they weren’t doing much good. In the end, there were so many expensive false alarms that the satellites that monitored the frequencies were turned off. The only time anyone searches for ELT signals now is when a plane is reported missing. The powers that be wanted to mandate newer and better technologies but the pilot and aircraft owner’s lobbies fought back against blanket mandates that required yet more expenses for every aircraft owner, when the ELT didn’t make sense for every mission. “We” won and the old law stayed put. So today, we have the old mandate that we must have a piece of equipment that isn’t monitored and probably won’t work when we need it, and the option of getting some very expensive gear that is helpful. In fact, if you have enough cash, you can get a GPS ELT that will inform emergency services not only where you are within a few feet, but the type of plane, her “N” number, and the home phone number of the owner. When we thought we were going to be in the rental biz, we discussed the value of this kind of gear as a service to our renters, but when our deal fell through and we ended up just being garden-variety plane owners (who had already spent double in renovation costs what the plane that now couldn’t earn her keep cost to buy) we decided to just equip ourselves with a garden-variety Personal Locator Beacon for our safety, and kept the old ELT for compliance. The only reason I’m telling you all of this is that a week later, the phone rang again. Some bad news. Steve and the boys had put the new battery in the old ELT and it didn’t work. Somehow, in the course of the year, the worthless (but required) battery-powered radio had died of old age. No one repairs them anymore. They are still made, surprisingly, but shockingly cost six hundred clams. Steve thought the money might more sensibly be put toward some tech that might actually help someone find us if we had the bad luck to go down. The newer systems are not that much more than six hundred bucks, but involve a more complex, time consuming—and therefore expensive—installation. It would also add several pounds in weight to an already underpowered and heavy plane. And to add insult to injury, once opened, the $40 battery for our dead ELT could not be returned. As it was legal for me to fly for a month or two without the ELT, probably because everyone knows it won’t help much anyway, Steve suggested he just log it as inoperable pending repair or replacement and give me some time to sleep on it. I flew home to SXU and at the dinner table that night Rio, Grandma Jean, and I kicked around our options while we waited for Debs to get home from work. On a whim, I checked eBay and found that a twin of our ELT was up for auction. Eight minutes remained. There were two bidders nickel and diming each other slowly upwards in the $20 range. The seller said it had no battery and he didn’t know if it worked or not. We had a battery that worked and an ELT that didn’t. If the seller’s ELT worked, and we won it, it would be a cheap solution to our problem. Of course, the downside was that if we won it and it didn’t work we’d be the proud owners of one battery that worked and two ELT transmitters that didn’t. Rio pointed out that if we bought it and it didn’t work we could use it as a paperweight. I said that we already had an ELT paperweight and couldn’t see the need for a pair. At the time, I guess it never occurred to us that they would make a fine pair of aviation accident-themed bookends. Still, in the moment, we could see that this could be one hell of a sweet solution. 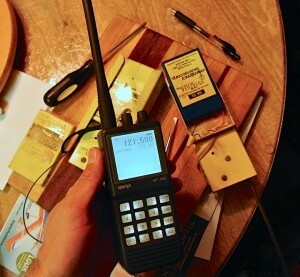 Yes, this type of transmitter is next to worthless, but it keeps us legal and wouldn’t change a thing for us. We’d been flying with this type of ELT from day one and never really worried about it. The three of us huddled around our iPad mini and watched the auction countdown in real time. In the last six seconds, our snipe swooped down from on high and strafed the other bidders. The price turned green, indicating that we were the winners at $40.05, plus another $12 for shipping and handling. A week later the ELT showed up. It looked like the one that should have been on Congressman Bogg’s missing plane. It was battered and scratched. The screws were rusty. It rattled when I shook it. This wasn’t looking good for the home team. But we’d come this far. We might as well go the rest of the way. I unscrewed the rusty screws to pull the battery cover off of the back of the battered yellow box. Inside I found the source of the rattle: A pair of plastic wire nuts to attach the lead wires from the sealed transmitter to the battery. The wires, however, had been cut. I tired to re-strip the red positive lead with a razor blade. The plastic was brittle and on the first attempt I cut the wire. Damn! It was a mistake I couldn’t afford to make a second time. I had less than an inch of wire to play with. Proceeding with painful slowness, I re-stripped the red lead again, this time with success. Then I stripped the black negative lead, it going faster from experience, and by some miracle not cutting my fingers in the process. The wire nuts that had been housed in the ELT like peas in a pod were as sad-looking as the ELT itself, so I used a new pair. “I have to say that I’m not overly optimistic about our prospects for success here,” Rio said. Yeah, I told him, I’m keeping my hopes down, too. It was 5:45 in the evening. ELT’s can be tested for the first five minutes after the hour, every hour. When we discussed it the week before, Rio worried what would happen if a plane had the misfortune to crash at the top of the hour. Would no one search for it? Never minding that ELT frequencies aren’t even monitored by satellite anymore, I assured him that in theory it would stay on and anyone still hearing the call for help by a quarter after the hour would investigate. We watched the clock. It’s amazing how slowly 15 minutes can pass. At 5:59 pm Rio turned on our Sporty’s SP-400 hand-held aviation transceiver, and adjusted the squelch and the volume. At 6:00 pm he double-checked the atomic clock in the master bedroom and assured me we were legal. At 6:01 pm I flipped the test switch on the battered yellow box. A yellow light nestled behind the five-G impact spring switch started slowly winking and from the radio’s speaker came a desperate rapid-fire signal. Erie. Spooky. Not quite Adam 12. Not quite Ghost Busters. The damn thing actually worked! Yeah, sometimes people think that we are rich because we own an airplane—and they are right. But it has nothing to do with how much money we have in the bank, which thanks to airplane ownership is actually a heck of a lot less than it used to be! Instead, we are rich in our adventures, our experiences, our family bonds, and our little victories. In all of those things we have wealth in spades, thanks to our airplane, which has been worth every penny. Still, I’m praying that Steve doesn’t find so much as a burnt-out light bulb next year! We lost a member of our crew this afternoon. Deb’s mother passed away a few minutes ago. I’ll post an obit later.